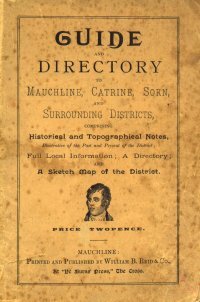 An interesting little book, published by William B. Reid & Co, of Mauchline, sometime between 1901 and 1906. (Poss around 1903) Robert Strathern died at Blackbriggs in October 1906, ref on Page 35, therefore dating the book at the latest early 1906, assuming the text was up to date at the time of printing. Thanks to Billy Gibson for the loan of the book. Warning: The files are images/ graphics of each page and are around 200k each. Maybe as time allows they will also be transferred to smaller text files. The centre pages in the original book were 4 pages between page 20 and 21. The centre pull out was not numbered, nor were any of the adverts at the start and the end of the book.